Do you ever get the feeling that you’ve bitten off more than you can chew ?, This is one location that Janis is not going to forget in a hurry !. (It also added a few more grey hairs to my head as well !!) 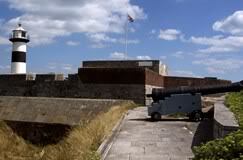 The spooky tunnels beneath Southsea Castle, hold more than a few surprises, as you’ll soon see.. 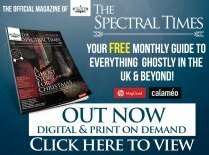 The castle itself has quite a few ‘spooky visitors’ to it, Time Tunnel Our first port of call was the ‘Time Tunnel’, this is a sort of interactive journey into the past. 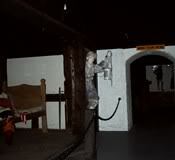 The castle’s history is animated infront of you as you walk through a collection of rooms. Past visitors to the castle have reported hearing scratching noises coming from the walls, and the feeling of not being alone. But you’ve only got to look at the pictures below to understand.. The animated dummy’s are pretty scary as they are ! – complete with friendly ghost that jumps out at you. We spent around half an hour searching the rooms, but found nothing really out of the ordinary. All-in-all, it is quite a creaky place – especially with the lights out !. Although all the time we where there, we just didn’t feel any kind of atmosphere. Time to move on, the tunnels where calling out to us.. It was getting quite late by now, but thankfully the light was still pretty good – its not a nice feeling knowing your going to descend into a maze of tunnels, only to know that if you did have to make a quick exit for whatever reason – its just as dark on the outside ! We hadn’t even entered the hallway to the start of the tunnel entrance when Janis let it unbeknown to us that ‘something’ was down there, she could feel it without even setting foot in the tunnels. We took a slow walk down the steps into the first section.. The first thing you notice while down there is that its very RED. The tunnel system is made up of thousands upon thousands of red bricks, strikes you as quite strange at first – as you’d probably expect them to use the same flag-stones that the rest of the fort is made-up of. As you’ll see on the film footage below, at one point the height between ceiling and floor was only 5 feet – not good if your over 6 feet tall. The tunnels seemed to go on and on, deeper and deeper into the ground below. Its worth pointing out though, that arrow slits can be found along certain sections – thankfully for us, as you’ll see later – it was a welcome addition !. The tunnels go for quite a distance around the outside of the castle – and through a few underground bunker rooms. It was here that the soldiers could run along the foundations of the castle, popping up where needed incase of attack. This is one location that Janis is not going to forget in a hurry.. Janis was already not comfortable about what lay in wait for us. We could see Infront of us that the chamber was about to open into a bigger room. Janis grabbed my arm !. There’s something around that corner ! Sorry !, I replied – but she was most insistent that someone was hiding from us just around the corner. Slowly we both edged into the room. As you could imagine, I couldn’t see anything. I asked Janis to point to the spot where it was standing. She prodded the area, before announcing that she HAD to leave. Janis began the long journey back through the tunnels at quite a pace. That left me stood there quite amused.. I took this picture at the very location she had pointed at, notice what could be an orb floating high above ground. I’ve inverted the picture to make it more clear. Now I cant say for sure it is an orb – but it sure is strange. I took over 30 pictures down the tunnel and didnt get any kind of ‘dust orbs’ or ‘reflections’. At the time I didnt realise I even had this pictured in the shot. I caught up with Janis outside the tunnel entrance she was feeling very hot and quite faint. it was here that Janis gave me the second shock of the day. While I was making my way back, I could hear a rush of wind coming up behind me. Then I felt a strong gust brush the righthand side of my face as it went past me !. It carried on going up the tunnel..
Wow !, Janis had experienced the paranormal firsthand. I felt quite proud that someone who has no mediumship experience was able to give such an accurate reading on the situation. As we later found out by examining the photo’s, her ‘something’ was where she said it was after all. I will admit though, I spent the next half hour trying to grip on what had just happened that had left Janis so shook up. Perhaps it was a freak gust of wind from one of the arrow-slit gaps ?. NO !, The gaps would have been on her LEFT HAND side – this feeling was on her right !?. Footnote: The video above is taken just after Jan came out of the tunnels, I went back in with nothing more than my phone to try to capture something. Unfortunately what I didnt realise is my boy (7 at the time) was behind me until it was too late. Towards the end of the video you’ll hear me say ‘it was a bird’ – I said this to calm him down.. only thing was – IT WASNT! – you can clearly see that no birds where in the tunnel at the time!